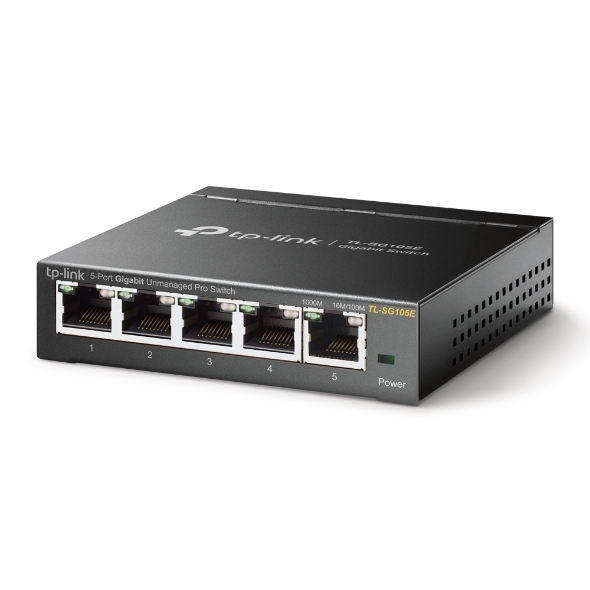 The TL-SG105E Unmanaged Pro switch is an ideal upgrade on unmanaged switches, suited for home and small business networks. A plug-and-play design makes for easy deployment without the need for a technician, while a robust metal housing provides better protection of your assets. 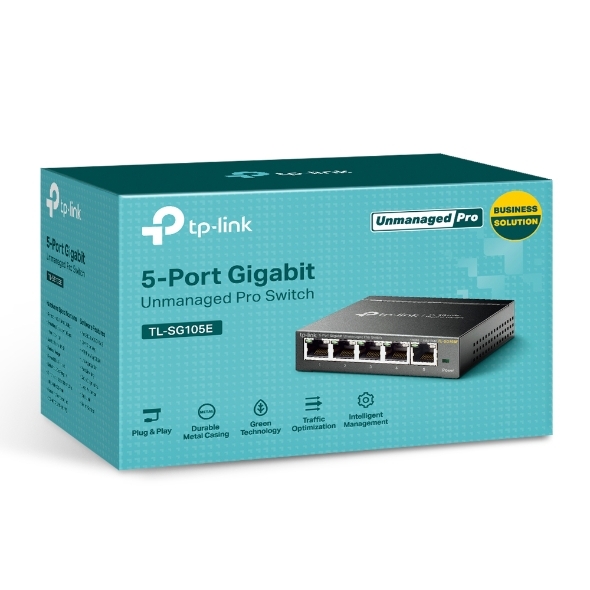 Equipped with adaptive network management features like QoS, VLAN, and IGMP Snooping, this switch is capable to connect managed networks without interruption. Connecting devices to TL-SG105E is simple. Auto MDI/MDI-X crossover on all ports eliminate the need for crossover cables or uplink ports. Auto-negotiation on each port detects the link speed of a network device and intelligently adjusts settings for compatibility and optimal performance. The TL-SG105E is protected by a high-quality metal housing to ensure a long product life. Having passed an array of stringent reliability tests, TL-SG105E delivers switching performance you can depend on. Its compact size makes it ideal for deployment on the desktop or over the work bench. 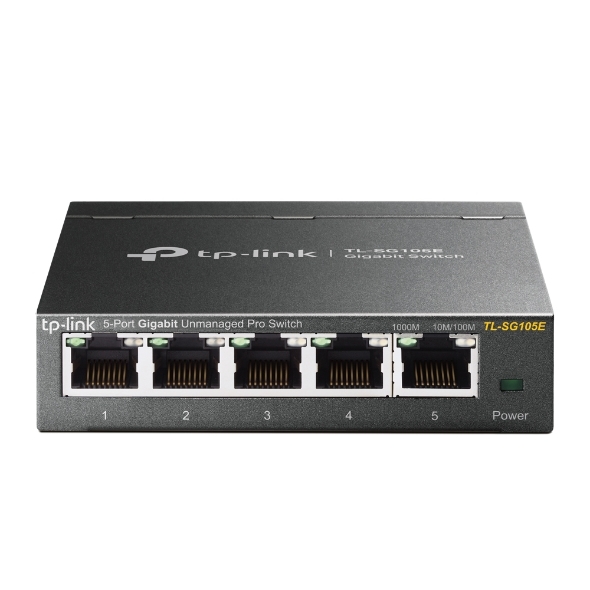 You can simple plug-and-play TL-SG105E and start using it. And, there are more traffic control, network monitoring, and troubleshooting tools available for more demanding network requirements. Network monitoring enables users to observe traffic behavior. Port Mirroring, Loop Prevention and Cable Diagnostics allow connection problems on your network to be identified and located. Administrators can designate the priority of traffic based on Port/802.1p/DSCP QoS, for example, to ensure that voice and video applications remain clear and lag-free. Combining security with network performance, TL-SG105E supports MTU VLAN, port-based VLAN and 802.1Q-based VLAN functions. TP-Link’s latest Unmanaged Pro Switches make adopts innovative energy-saving policies. Power consumption automatically adjusts according to link status and cable length, allowing you to expand your network while minimizing your carbon footprint. Save the planet and lower your energy bills — it’s a win-win! 3.9 x 3.9 x 1.0 in.